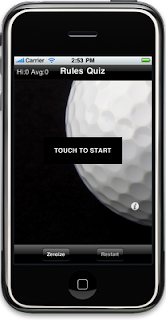 It was back in January of this year that I wrote about a new application for referencing the Rules of Golf for iPhones and iPod touch users. Little did I know then that I would be blogging on a new application, ‘Golf Rules Quiz’, for the iPhone and iPod touch, for which I have provided the content. 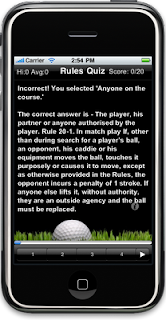 ‘Golf Rules Quiz’ has been developed by Irish, remote eLearning company, Ossidian Technologies, with multiple choice questions, answers, references and explanations provided by me. With their history and experience in computer-based training programs Ossidian have proved to be an ideal partner in this venture. Golf Rules Quiz will definitely help you to understand and absorb the Rules of Golf in a most enjoyable and entertaining way, and at just €3.99 ($4.99) is a must for anyone who enjoys golf and who has access to an iPhone, or similar. 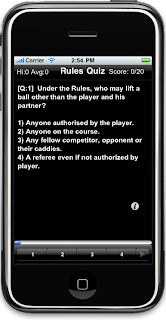 It can be purchased direct from the iTunes store (search for ‘Golf Rules Quiz’) or at iPhone Applications. Author of ‘999 Questions on the Rules of Golf’ - a book to help players of all capabilities to understand the Rules. This is an incredibly useful app for both starters and also for players who just want to brush up and make sure they know everything. Add this to a stroke tracker app and anyone is good to go. Thank you for that comment. I know that the developer, Ossidian Technologies, would be delighted if you would post a review, or at least a rating for Golf Rules Quiz, on the iTunes App Store. Actually the theme is good one! from the point of view of golf.This will be simply quizzing out the most required features in golf.